Are you excited about Feed My Starving Children's mission? Would you like to tell our story and help our mission grow? 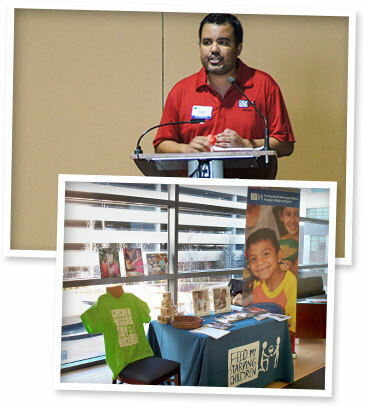 Be a part of Feed My Starving Children's Speakers Bureau! Join amazing staff and trained volunteers to share your passion and heart for FMSC, advocating on behalf of starving children around the world. If you are interested in learning more about becoming a speaker, please fill out and submit the information requested below. At this time, we are looking for speakers in Arizona, Illinois, Minnesota and Texas. Once we receive your application our Speakers Bureau Coordinator will contact you with more information. Past Speaking Experience: This is helpful information for training purposes. If you have no prior experience, simply let us know. Feed My Starving Children believes that Christ is the foundation of the work we are called to do, do you identify with this belief? Have you volunteered in the packing room twice within the last 12 months?